Cliftonville have completed the signing of highly-rated Warrenpoint Town striker Daniel Hughes. Hughes has agreed a two-and-a-half-year deal with the Reds and will join the club on January 1 when the transfer window officially opens. The capture of the 23-year-old striker is a significant statement of intent from Cliftonville, who currently sit second in the Danske Bank Premiership – five points behind leaders Crusaders. Reds manager Gerard Lyttle has hailed the signing of Hughes – who had also attracted interest from clubs across the water and from a number of Irish Premiership rivals, including Linfield. “Daniel has won many admirers with his performances for Warrenpoint over the last few years and is a proven goalscorer at this level,” Lyttle told Cliftonville’s official website. 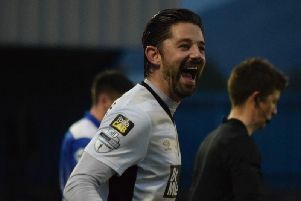 Warrenpoint Town boss Barry Gray added: “It’s a fantastic move for Daniel at this stage of his career. He has developed with us and we always want to best for our players. Hughes added his thanks to Warrenpoint and boss Gray. “I have loved every minute of my football at Warrenpoint,” he said. “They are a fantastic family club and to play at the highest level in local football with my brothers meant a lot. I thank all the fans, the board and my club mates and of course Barry Gray for everything.